Our KPB77 pillow box measures 4" x 1 1/8" x 6" and has a usable space of 4 7/8" (middle length). 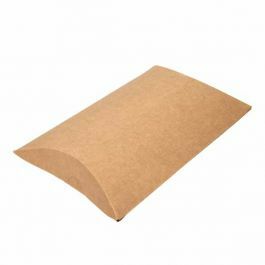 This brown paper box is made from 230 gsm Kraft Board and is an eco-friendly option for retail packaging. This size works great for small journals and electronics. Stickers are included, to purchase additional stickers click here to see our full list of sticker options. 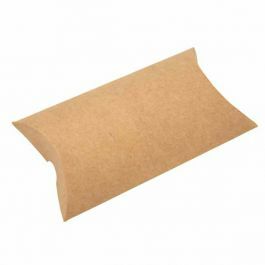 Our Kraft PIllow Boxes are a great eco friendly option for retail packaging. Our KPB77 pillow box measures 4" x 1 1/8" x 6" and has a usable space of 4 7/8" (middle length). These brown paper boxes offer a natural look for soaps, herbs, and any product with botanical ingredients. They also work equally well for notebooks, cosmetics, and electronics. Made from 350 gsm Kraft board, these unique boxes make a memorable impression. Personalize with stamps, stickers or a stretch loop. Product comes with clear round stickers for a secure closure.